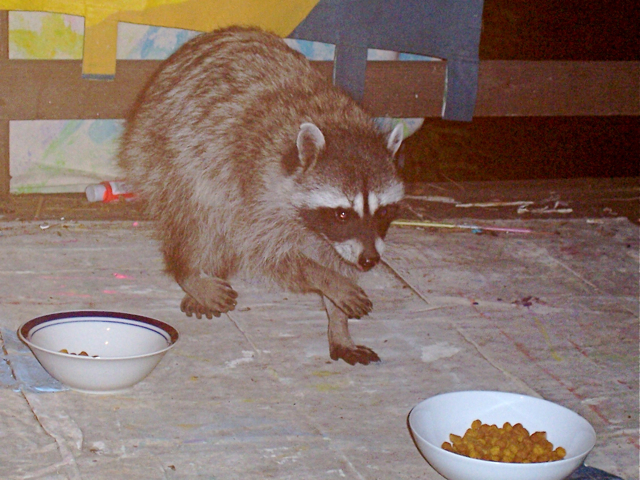 The blind mother raccoon's daughter (now grown) heads for the cat kibble. The first time that I saw her was at midnight in my kitchen. I had just returned from work and had forgotten to shut the back door. I have cats, and always leave kibble out for them. Apparently, the smell had attracted her. 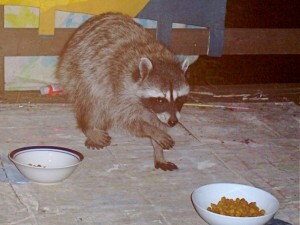 I had written an article on raccoons before, so I knew to start making noise and turning on lights. They don’t like either one. She was headed for the back door, when she suddenly turned around. What was she doing? I got scared. Then I could see the two little “kits” with her. They were the size of a baby cat, all cute and furry, but with that distinctive black band across their beady eyes. I went for the food drawer, and started getting out some kibble, and promised them more if they left. I put it out in a pie tin and watched as each of them delicately lifted the food with their hands and ate it. All the while, they didn’t take their eyes off of me once, except for the mother. I didn’t realize that something was wrong with her until several visits later when she came by herself. She was on the porch ledge eating the bread that I left out for the bluejays. She reached for the food, but missed the pan. She tried again and missed. The third time, she found the food and ate it. I could see in the porch light that her eyes weren’t quite right. Almost a little cross-eyed and tired. They didn’t shine like her kittens’ eyes. I didn’t tell her about the earlier visit. “I heard that if raccoons, which are nocturnal, go out searching for food during the day, they can burn out their retinas,” some student told me. “Isn’t there any raccoon glasses that we can give her?” I teased. I was concerned that if this mother raccoon couldn’t see me, then she couldn’t see any predators either. 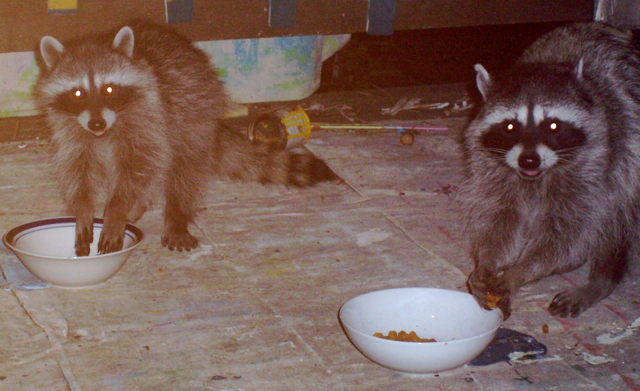 (from R) The blind mother's daughter and grandson dine on my back porch. I knew what she meant. She wasn’t talking about bears, but the danger of feeding wild animals. Not only for us, but for them. We could get bitten, and they could become dependent, and let their natural defenses down. But what about the blind mother raccoon? Would it be better to let her forage for her own food? It seemed a little cruel. “Well, she’s teaching her babies that they can dine at your place sometimes,” said my mother. I had heard of a “Raccoon Lady,” in Idyllwild, who nurses baby raccoons back to health. She’s also a pretty good hairstylist. I plan on talking to her soon. Perhaps she could advise me on what to do next.